Dad | journalmehealthy: is what i see in the mirror real? He came from an economically depressed region of the country to a family that would most certainly be considered poor by most standards. He became a hero to me (and many others) and his legacy lives on for and through me. He was my dad. And his strength came from his relationship with Jesus Christ. My dad grew up in Harlan County, Kentucky, born to a young couple and two older brothers. In his first years, he was ill as a result of a vitamin deficiency. A younger brother died around age 2. At some time in his young life, his parents operated a boarding house for workers of the mines or railroad, where his mother cooked for the boarders. Smart, outgoing, and talented (as were his brothers), he learned to play the guitar with ease. His mother carried a gun for some time, ready to take the law into her own hands against the men who had killed her brother. When missionaries came to the area to minister, my grandmother found God, and soon my dad and his brothers were sent a few counties away to a Christian boarding school. My dad was only 13 when he started 9th grade away from home. It was there that he fell in love with God and the piano. He had such a natural talent for the piano, that when at one point he got bored and wanted to quit, his teacher informed the president of the school. This small but fiery lady informed him she would send him home if he quit the piano. He agreed to stay, knowing the punishment he would receive at home would be far worse than continuing piano lessons. His love for playing grew and he dreamed of being a concert pianist, famous around the world. In 12th grade, he felt God was calling him to preach, but the dream of being famous influenced him to deny that call. Before that school year was finished, he was in the hospital with a fluid-swollen spinal column. A spinal tap was done, and within hours he was paralyzed from just above the waist to his toes. Doctors were not sure if he would live, and they were certain he would never walk again. He promised God that he would preach from a wheelchair or bed if God would spare his life, and he always said that God healed him. He went through physical therapy and eventually regained his strength and was able to walk. His older brother, Alvin, would carry him from the bed, setting him on crutches to wash the dishes for his mother. (When he spoke of this, he would always get emotional with admiration for a brother who was strong enough and kind enough to care for him this way.) Even though he wasn’t back to full strength, he was drafted into the Army. Within a few weeks of marching, he was hospitalized and discharged. He returned to the Bible college associated with the Christian high school, where he spent time working at the radio station. He met my mother and they married shortly after she graduated from the college. He was told that he would never father children, but that clearly turned out to be untrue! He was determined to have his family experience as much of the country as possible. We traveled every summer – to Ohio to visit my mom’s family, to Michigan to visit college friends, to spend time with uncles, aunts, and cousins at beautiful sights where revivals were scheduled, to historical sites in Virginia, Pennsylvania, and various other places to encourage our patriotism. No matter what the sights were, no matter how far he had to walk, he sacrificed for us to see it, knowing that his legs would ache and shake all night, preventing good sleep. My brother, Chris was born while they completed their baccalaureate degrees at Asbury College, living on the property of my grandparents who had moved there to work at the college. Dad also learned the craft of piano tuning. They returned to the mountains of Eastern Kentucky to minister in the organization where they had completed high school and Bible college. Dad taught piano, organ, voice, chorus, and piano tuning at the college, and spent some time directing band at the high school. He directed performances of Handel’s The Messiah for years. He also took opportunities to preach or play the piano in revivals, at camps, and various church services across the country. Dad was required to take one night a week to relieve the faculty member who was in charge of the men’s dorm. If Mom had duties on the same night, he would take me with him to keep him company in Mr. Davis’ office. The men were supposed to be studying during that time, but many of the them came to him to get his fatherly advice or exchange jokes. I just sat and watched a master encourager. When my brother was about to turn 20, just months after his wedding, the family (without me) decided to visit a state park for a weekend to celebrate his birthday a week early. They dropped off their things and proceeded to view the sites where Chris was involved in a fall. He had a head injury and was unconscious for two and a half weeks before he died. 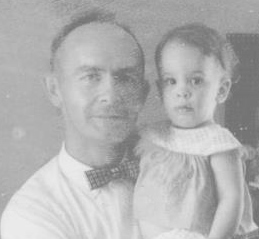 I listened to my dad’s body-shaking sobs on the way to the hospital, wondering if I would lose him, too. He changed after that. Oh, he still told his same old, lame jokes. He still had a clever quip to other smart aleck words or actions of students, but the brokenness was obvious, at least at home. If Chris’ name was mentioned, he was immediately shedding tears, and so I refrained from bringing him up at home, in fear that it would be to heartbreaking for him. When I made it to college, I had the privilege of singing The Messiah under his direction. I watched tears stream down his face as we sang, “Surely He has borne our grief and carried our sorrows,” and he put every ounce of energy into leading us. I don’t know of anyone who could sing with less than 100% effort, knowing the kind of grief he had experienced. And that is what makes him my hero. I can’t imagine the oppressive grief of losing a child. Getting up everyday, working … just putting one foot in front of the other. I’m not sure how people can do it. But Dad kept going on. He kept giving piano lessons. He kept directing the chorus. He kept reading God’s Word daily. He kept preaching. He kept showing everyone he met how God loved and sustained him. Years later, Dad had a stroke and was unable to care for himself or even talk for 14 months before he died. My daughter overheard me telling someone about my dad’s dream of being a famous concert pianist. She later said to me, “Mom, Grandpa was famous,” and proceeded to remind me that he knew people around the world. She was right. He taught students for 35 years, some of whom are missionaries around the globe. He tuned pianos all over Eastern Kentucky and many other states. He preached all over the country. He even traveled three times to Papua New Guinea to tune pianos for missionaries, to preach, and to sing. Dad was a small-framed man, and he walked with a significant limp all my life. Most people catching a first glimpse of him would not consider him strong. And yet he was the strongest man I have ever known. (Besides the fact that he could take a much larger man to his knees with his unique handshake.) He never held back tears to express his own grief, in empathy for others, or when he felt the love of friends he knew he could count on. And his legacy of sacrificing to show God’s love lives on as I do the work of helping people who are at a low point find the hope and courage to change. He was a God-worshipping, family-loving, music-performing, coffee-drinking, ever-whistling, joke-telling, people-encouraging, Kentucky Wildcat-cheering, Super Dad.